The benefits of sponsorship at various levels are listed below. All sponsors, regardless of level, receive verbal recognition at the Annual Conference, as well as printed recognition in conference materials, a sign listing all the sponsors, and in the Municipal Analysts Bulletin. Also, all attendees from the sponsoring firms will receive a color-coded ribbon prominently displayed on their nametags indicating their organization’s sponsorship level. Finally, an advertisement will be placed in The Bond Buyer during or subsequent to the conference enumerating all sponsors and their respective levels. These are all benefits referred to herein as the “Basic Sponsorship Benefits”. *** Diamond Plus - New Level *** – $15,000. All of Basic Sponsorship Benefits, plus listing as a sponsor of all NFMA educational events taking place in the calendar year 2019, including, but not limited to, Advanced Seminars in January and October, the Annual Conference in May, and the Introduction to Municipal Bond Credit Analysis in the Fall. Six members of your firm may attend the Annual Conference in Charleston with complimentary registrations. Exclusive Benefit: Diamond Plus Sponsors may exhibit at the Annual Conference with no additional fee, and have the right of first refusal for exhibit tables. Exhibit tables will be available on a first-come, first served basis (costs of wi-fi, electrical service, etc., at hotel are the responsibility of the sponsor/exhibitor). Our ad in the Bond Buyer will recognize Diamond Plus Sponsors at the top and we will add Diamond Plus Sponsors to the homepage of our website, www.nfma.org, and to the banner of our conference app, Whova. At their own expense, Diamond Plus Sponsors may also present a marketing “giveaway” at the Annual Conference (such as pens, notepads or other items approved by the NFMA) referencing your company name or logo. This benefit will be available to Diamond Plus Sponsors only. Diamond –$10,000. All of Basic Sponsorship Benefits, plus listing as a sponsor of all NFMA educational events taking place in the calendar year 2019, including, but not limited to, Advanced Seminars in January and October, the Annual Conference in May, and the Introduction to Municipal Bond Credit Analysis in the Fall. Four members of your firm may attend the Annual Conference in Charleston with complimentary registrations. Platinum – $7,500. 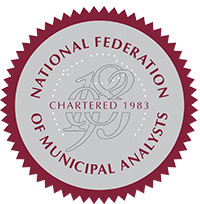 All of Basic Sponsorship Benefits, plus listing as a sponsor of all NFMA educational events taking place in the calendar year 2019, including, but not limited to, Advanced Seminars in January and October, the Annual Conference in May, and the Introduction to Municipal Bond Credit Analysis in the Fall. Two members of your firm may attend the Annual Conference in Charleston with complimentary registrations. Gold – $5,000. All of Basic Sponsorship Benefits, plus one member of your firm may attend the Annual Conference in Charleston with a complimentary registration. Silver – $2,500. All of the Basic Sponsorship Benefits mentioned, plus one member of your firm may attend the Annual Conference in Charleston with a discounted registration of 50%. Bronze – $1,000. All of Basic Sponsorship Benefits mentioned. Tuesday Welcome Reception – $7,500. This will consist of an open bar and hors d’oeuvres for an estimated 300 - 350 guests during the reception on Tuesday night. The sponsor of the Tuesday night reception will receive prominent recognition in the conference program, on Whova, and on signage at the reception. Two members of your firm may attend the Annual Conference in Charleston with complimentary registrations. Continental Breakfast Sponsor (Three slots available) – $3,500 each. Specific recognition in the program, on Whova, and via signage at the event. Break Sponsor (Four slots available) - $2,000 each. Specific recognition in the program, on Whova, and via signage at the event. Wednesday Luncheon – $7,500.The sponsor of the Wednesday luncheon will receive prominent recognition in the conference program, on Whova and table tents at each table recognizing the sponsor. Luncheon attendance has run between 350 and 400. Two members of your firm may attend the Annual Conference in Charleston with complimentary registrations. Thursday Night Reception – $10,000. This will consist of an open bar and hors d’oeuvres for an estimated 300 - 350 guests during the reception on Thursday night. The sponsor of the Thursday night open bar will receive prominent recognition in the conference agenda, and at the reception. Two members of your firm may attend the Annual Conference in Charleston with complimentary registrations. Wi-Fi Sponsor – $5,000. The Wi-Fi sponsor will have naming rights for the meeting Wi-Fi to be entered by all attendees during the conference. One member of your firm may attend the Annual Conference in Charleston with complimentary registrations. Please contact Lisa Good, 412-341-4898 or [email protected] for further information.